We Are Justice is a community justice blog. Follow along as we address community justice in Richmond, Virginia. In partnership with the Richmond Times-Dispatch, we're publishing an Op-Ed about each theme of community justice. We'll share them here along with other news and information about the series. In-person visits have a positive impact on prison safety and are crucial to those behind bars. Furthermore, research says that visitation is one of the most important keys for prisoner re-entry and that it significantly reduces recidivism, i.e., the return rate to prison. Why, then, are we seeing more repressive restrictions, and, importantly, shutting the door to real visits as institutions try to replace them with video visitation? You can read her full piece online at Alternet.org, and learn more about Jean's work at her website. We include career-development because it is equally as important as jobs and workforce-training. “Career” suggests a living-wage position that provides growth for individuals and their families. So while finding a job is a start, we must also pay attention to what career-development looks like for various communities. It’s important that we agree to a baseline definition and understanding of wealth or wealth-building. The definition and understanding of wealth can vary between individuals, communities, and even zip codes. For some, wealth means owning a home or land to leave behind for family. It may also mean having a solid retirement plan, stocks, and other investments. For others, wealth is oftentimes an intangible word because of the lack of financial means or resources to join in the conversation. Even saving is hard because, after regular bills and responsibilities, there just isn’t any money to put away. This gap in access and capacity is why it’s necessary that community justice be included in conversations and plans about job-creation and wealth-building. As job-creation and career-development are recognized as key elements of sustainability, we must ensure representation of all residents at the wealth-building table when addressing concerns of access and opportunity. When we have sustainable jobs or careers, we are able to take care of ourselves, our children, and our families. This behavior and ability is observed by our children and creates a level of confidence and competence that cannot be bought. The sense of responsibility, value, worth, and identity goes beyond a job and, in turn, sustainability is created. Historically, our American society can be viewed as having been built on a caste system that we often pretend doesn’t exist. The never-ending trend has been to marginalize massive communities of color while the wealth and power gap increases. With mind, body, and spirit left broken from years and years of hard labor, it is difficult to climb out. There isn’t an election year or politician that passes by without “jobs” being mentioned, yet few employment opportunities exist in lower-income communities — and almost no white-collar jobs make their way to those communities. People are less likely to challenge the status quo when, for generations, they’ve been made to feel lucky to have their job, their home, and food to eat. The system continues to be as strong as it was during the days preceding the Civil War — and communities and people are still kept from jobs for a number of reasons. We cannot consider a society just when it allows the most vulnerable communities to suffer, which is why there needs to be a push to bring more jobs into these neighborhoods where they can add not only to economic growth in the community, but to the overall quality of life. Job-creation and career-development should be a priority for communities in the margin, moving residents from crisis to thriving. When residents have well-paying jobs and or careers, they are able to re-imagine life from survival mode into plans for safe and affordable housing, emergency savings, and eventually wealth-building. What we do know is that Richmond has been there before — in a society where communities are invested in and where people are provided the knowledge and opportunities to create their own wealth realities. Think Jackson Ward circa 1910. Banks and department stores were owned and operated by marginalized people, namely black individuals and families. Yet Jackson Ward still stood as a community that was thriving and flourishing, providing a variety of services to a wide range of people. The passage of the Federal-Aid Highway Act resulted in the economic digression of Jackson Ward’s thriving culture and economy. This federal, state, and local divestment then paved the way for further, discriminatory practices, such as red-lining. Currently, Richmond is at a critical juncture. As the area grows and expands, several organizations and business are interested in the landscape of job-training as well as workforce- and/or career-development. Universities are attempting to leverage resources and the city has established the Office of Community Wealth Building, which is designated to lead a community-wide vision and plan for systematic change in Richmond. There is much work to do — but more importantly, it is happening. Through the lens of community justice, we will continue to use a collective voice through this process of necessary change. Let us all continue the conversation and ensure the creation of seats at the table for our neighbors across racial and socioeconomic differences. We invite you to join with a community of citizens concerned about job-creation and wealth-building in Richmond for a film, discussion, and solution-oriented planning. Join us at the Robinson Theatre (2903 Q Street, Richmond 23223) on Saturday, Feb. 17 from 11 a.m. to 3 p.m. The gathering is free, family-friendly, and part of an ongoing effort to bring Richmonders together in support of more equitable personal and economic advancement for all. Brittany Bush is member of the Together We Will RVA (TWWRVA) steering committee, where she works with the diversity team to further its mission of uplifting voices and issues of marginalized communities and peoples. Adrienne Cole Johnson, MSW, is a social justice professional focused on creative approaches to change who has worked in the areas of engagement, education, entrepreneurship, and politics for the past 20 years. Rebecca Keel, MSW, is a community organizer who focuses on intersectional social justice and creative approaches to dealing with current and historical conflict. Jackie Washington, MSW, is a community convenor and supporter of grassroots organizing efforts for Richmond’s marginalized yet resilient communities. Today Leaders of the New South (LNS)’s Community Council for Housing assembled with Richmonders from across the city in support of public housing residents who have lived without sufficient heat for over a year. LNS leadership Omari al-Qadaffi has done a tremendous amount to chronicle the last week in the lives of Richmond Redevelopment Housing Authority (RRHA) tenants. He has identified heat deficits in major housing developments across the city. The testimony of residents is incredibly moving: families sleeping in layers of coats and blankets, individuals with targeted health needs who are unable to seek out shelter elsewhere,* thick sheets of ice formed on interior walls, families heating their homes with their ovens, and residents given space heaters by RRHA only to be charged for electrical use overages. For years, the housing authority has discussed decentralizing poverty by breaking up the massive housing-block developments, well before Somanath, formerly head of the Richmond Better Housing Coalition, came out of retirement. Gilpin Court resident Lillie A. Estes, the organizer behind tenant advocacy group Residents of Public Housing in Richmond Against Mass Evictions, known by the moniker Rephrame, and a 2016 mayoral candidate, says the most recent push is occurring in circles that do not include public housing residents. The city seems immune to the notion that tenants should contribute to the governance of their own housing. For over a year tenants have demanded repairs to the aging heating system. For over a year the city has offered space heaters and held off on repairs. Finally this week the city partnered with a private hotel to relocate residents until the cold passes: an insufficient solution that would leave tenants without kitchens, transportation, or access to the communities in which they live. Despite repeated statements from residential and community leadership that hotels would not meet the needs of residents, the city feigned surprise when many residents refused to relocate. Also apparently immune to any sense of decency, RRHA demanded residents who remain sign waivers releasing RRHA of responsibility for tenant safety in freezing accommodations. We have pushed back against housing policies that either gentrify our communities or leave them blighted. Education policies fail our children and educate them in crumbling buildings. Transportation plans that force us to walk farther, wait longer, and leave us 3 miles from all the places that we need to be. There is no economic development plan for black people that addresses systemic economic inequality. We penned our hopes on an “Office of Community Wealth Building” that has been implementing policies penned by white neo liberals who continue to funnel money to the white housing development class, their friends and cronies in the mistaken belief that only through paternalism can black people find relief. The removal of federal protection that poor black people are under and confiscation of land. The continued transfer of wealth from blacks to white developers in the form of housing vouchers and control of city dollars. Art goes on to say, “In the ‘mixed use development’ the only salvation for blacks comes from living with white people or turning over the control of our communities to the corporate class.” His analysis is backed by research. There is no evidence poverty deconcentration alleviates poverty. There is evidence it is insufficient to intervene in poverty, it disrupts communities, reduces the access of low-income individuals to much-needed public services, and fuels gentrification. Why do cities favor this method? In many places, as in Richmond, developers have a disproportionate hold over city leadership. We live in an era where starvation of public resources provides a perfect landscape for private interests to offer “solutions” for profit. Today’s revelation from @brothermanifest : Less emphasis on deconcentrating poverty and more on deconcentrating wealth. Today was a milestone. Public housing advocates are amplifying public voices in a city where corporate interests have been given a megaphone. When residents like Burton, Estes, and al-Qadaffi fight on behalf of public housing residents, they set the stage for a broader fight in which all of us have a stake. Richmonders have a right to democracy in their city. It is our city, these schools are our schools, and our communities have a right to robust public services with equal access to public governance. The only solution to problems created by economic starvation is through community investment: fair wages, job creation, accessible food and transportation, and robust school funding. We can have all of these when we wrest control of our city from the hands of its incredibly small but powerful developer class. * For more direct reporting on resident experience you can see Omari’s facebook page, or read coverage by Michael Paul Williams in the Richmond Times Dispatch. **There are so many examples it would break my heart and my server to list them all here, but the example that currently interests me the most a 2007 letter signed by what has become known as the “gang of 26” arguing against a democratically elected school board and in favor of a board selected privately by local business leaders. Consider that a moment: Richmond business leaders feel so entitled to run our city that they demanded the elimination of democratic governance of schools in favor of private management. AS WE MOVE into rounding out these last two #CommunityJustice Film Series Screenings, I thought that I would take some take to reflect in writing. THE GOAL has always been about enlarging the numbers of community member participation, engagement if you will of what governing actually becomes with that participation. The buzz of what we can and must do is resonating BUT WE CAN DO MORE AND WE MUST DO MORE. #CommunityJustice, the way I see it is collectively co-visioning and co-creating community power, an “incubator for action” as one of my community children coined for us. The community must resume its rightful place in the establishment and or re-establishment of how our communities grow. THE CHALLENGE IS IN THE STRATEGY OF HOW WE GROW AND HOW WE DO MORE GROWING….. EFFECTIVELY. Collective Co-Creating is an acquired skill. The learning is born from many false starts and failed attempts but we get up and we improve from the learning. TODAY we gather to forward think through AND to solutions addressing the transportation aspect of #CommunityJustice. JOIN US at 2:30PM in the United Steel Workers of America Local 400’s Union Hall, 184 E. Belt Blvd RIGHT IN FRONT OF THE GRTC HEADQUARTERS…. LITERALLY. The plan is to focus on how more community members step into embodying what collective co-visioning and co-creating solutions that work in real time for what the empowerment of community members becomes. When the idea to commit to developing this community engagement model began, capturing in real time the input of the community while honoring a newly created standard of operation that builds and rebuilds community power so community members can become engaged and remain engaged was and still is a major concern. What has emerged are some profound community led structural standards that I hope will continue to [re]set our forever evolving community member participation. THE MOST IMPORTANT PART OF #CommunityJustice IS THE ACTUAL PARTICIPATION OF MORE AND MORE COMMUNITY MEMBERS. IT IS JUST THAT SIMPLE. AND AGAIN, the challenge is in the how we remain engaged and effective in establishing this consistent community collective co-visioning and co-creating. We’ve got to own it and use it to the greater good. I’m excited for your.our future participation in the coming hours, days, weeks, months, years and decades (I believe I have a few more decades in my spirit). Let me pivot right here. MORE COMMUNITY MEMBER PARTICIPATION DOES NOT need to become and or remain a contest of wills. It is our right and it is our duty to remain active community members. #CommunityJustice is about inclusion in every aspect of that embodiment and as such we intend to teach each other and support each other in this evolving participation. We are two years, actually three years old. Our preliminary planning began in the Fall of 2014 and here we are today in 2017 having accomplished a pre-launch, kickoff reception launch and four film screenings. After today our last screening takes place on February 17, 2018 with the theme of JobCreation WealthBuilding. We look forward to post screening community work around actions such as our roll out of our #CommunityJustice Resource Fairs, a more specific community dialogue process_UNNAMED at present, a convocation, a #CommunityJustice Conference and just regular community member participation in the happenings of what operates this city and region we all love because we are justice within our communities. “We Are Justice” IS ALSO the title of this blog, our blog page http://www.communityjusticefilmseries.com/blog/, provided by another one of our community members and WE INVITE YOU to cyber travel here when the urge is before you. BE INSPIRED TO BECOME COMMUNITY WHEREVER YOU ARE !!! Imagine not having reliable transportation, and constantly having to figure out how to get to work, how to transport your family, how to maintain extracurricular activities, and how to access well-rounded activities for your family. Not only are you car-less, you also live on a side of town where public transportation routes are less frequent and limited. While taxi cabs and car services such as Uber and Lyft sound easy, when maneuvering on a daily basis they are quite costly. And to top it off, the majority of your social circle is in the same predicament, so catching a ride with someone is really not an option because most of your acquaintances do not drive. For a moment, sit with these questions: What would you do? How would you handle transportation for yourself and your family? How would this affect your current life, personally and professionally? If you took the time to react to the questions above, chances are that you felt a bit of stress and anxiety, just at the thought. And unfortunately, this is a regular consideration for many of our Richmond-area population — especially those residing in communities that are more polarized by a lower socio-economic status. Many times, when people think of community justice, transportation isn’t the first thing that comes to mind; rather wealth, opportunity, and privilege distribution. Yet when you consider these characterizations and how limited access or simple lack of transportation plays out, we learn that transportation must be intimately woven into the community justice conversation. Without adequate transportation, it is hard for individuals living in impoverished communities to find and maintain jobs outside of their immediate neighborhood. If employment is found outside of the neighborhood, it is often difficult to maintain. As we know, late arrivals and no-shows, due to any circumstance, are not often met with understanding in a professional work environment. Locally, lack of adequate public transit clearly impacts education and family inclusion in our schools. Most of us are aware of the lack of accredited schools in our city’s’ most vulnerable communities, so when making the choice to apply and send your children to an accredited or specialty school outside of your zone, you must provide them with transportation to and from school, as well as extracurricular activities. Transit-dependent citizens could be deterred from participating in school activities and parental events, thus lowering their student’s chances at successful education-related outcomes. In general, experience and exposure are often limited when lack of transportation is present. While there are organizations and programs that push into communities to add support, there are so many points of exposure that are not experienced by our transit-dependent residents. Equitable options and fair solutions for all are truly at the core of social justice — and while education, employment, exposure, and housing are often at the forefront, transportation is just as important and crucial to creating just communities for our most vulnerable and underserved residents. Cities like New York, Philadelphia, and Washington provide their citizens with the opportunity to travel across town and surrounding counties to go after better-paying jobs, safe and affordable housing, and educational-enriching communities. HUD data indicate that participants in voucher-based poverty deconcentration programs have a tendency to move into and stay longer in transit-rich neighborhoods. Thus, neighborhoods with diminished transit coverage become less desirable to transit-dependent and typically low-income residents. As historical housing movements continue to occur, we are now experiencing what nationally acclaimed urbanist Alan Ehrenhalt describes as The Great Inversion. Simply put, American cities are changing, and the high concentrations of low-income transit-dependent residents near city centers, as a result of decades of racially motivated housing practices, are now experiencing lower levels of access to those suburban jobs. So knowing this, what can you do? Get involved. Richmond is beginning the work around transportation, and there are various entities seeking to solve our transportation challenges. From the Richmond Regional Long-Range Transportation Plan to the GRTC’s aggressive approach in connecting the city, there are entities that need to hear your voice. When providing your valuable resident experience, remember all of your neighbors. Not just the West, but the East. Not just the North or the South. The more we consider one another in our planning, thinking, and strategy, the closer we will be to creating a united Richmond that we can all be proud to call home. Transportation is truly a quintessential part of community justice and is a solid pillar of success. Let us keep this in mind as we go about the work of our city. We invite you to join with a community of people concerned about transportation access in Richmond for film, discussion, and solution-oriented planning. Join us at the United Steel Workers of America Local 400 (184 E Belt Blvd, Suite 400, Richmond, 23224) on Sunday, Nov. 12 from 2:30 p.m. to 5:00 p.m. The gathering is free, family-friendly, and part of an ongoing effort to bring Richmonders together in support of more equitable personal and economic advancement for all. Is The Community Justice Film Series (CJFS) Entertainment or Education? We think sometimes, another documentary, another movie, another video rant. How are these films helping us in achieving justice in our communities? Sure they make us feel something as we watch the films and then we talk about the film at the showing event and we feel good like maybe I can do something. Or we feel angry like maybe I better do something when I leave this place. Then we leave and life continues in the same way. Our family and personal problems and traumas caused by the embedded and overt injustices continue just the way they always have and we continue to adapt and in that adaptation the mutation of our minds and souls continue. The true human inside yells through the daily stream of oppressive injustices and through our mutated thoughts and we hear. It says; check out the films maybe there’s something that can help me cause this #$@&*! just ain’t right. But the mutated self says; it’s just a film and people talking, I can look at a good Netflix movie by myself. And anyway how you gonna do something to help somebody and you can’t even help yourself against them #$@&*! And that’s the point you can’t win against them, the oppressor, the unjust , the privileged caste, the controlling class, not by yourself. No one can do everything for themselves. We need each other. The purpose of CJFS is to ignite participation in the democratic process using documentary films about issues of injustice that provide “a catalyst to gather our communities and engage in active, forward-thinking dialogue around six themes…” Three events have passed; Education and Whole Body Wellness and Public Safety.. The documentary films were informative and motivating at the events. The discussions that followed were even more informative and motivating. Most of all people met each other and found out they are not alone in the struggle for their freedom, equality, and inclusion. The remaining films in the following themes will be: Housing, Transportation, and Wealth Building. And will conclude with a Resource Conference after the series’ topics. Some are benefitting from the CJFS by following through on the social and political justices we have dedicated ourselves. Some are still asking where should I begin. CJFS is posting on our website information about the events and inviting everyone to post information about the subject and resources, those who attended and those who are knowledgeable about the specific themes. We want to know what you are doing about injustice and how others can join your efforts. So the question, is CJFS entertainment or education? My response, it’s motivating, informational, but just entertaining, if you do nothing. It’s educational when we take forward thinking actions to to stop our oppression by government at all levels, institutions and even the oppression of ourselves. Here are some things that the CJFS planning committee suggests we all do after and between each film event. Have ongoing house gatherings to keep your circle together around the justice themes you are working. Post a blog or create a log/diary of the things you learned everywhere, your thoughts or ideas on social, political, and economic justice. Create an alert call/ email list of at least five to ten people involved with the theme after each film or activity associated with the theme(s). Host an activity associated with the theme event you attended and share it with CJFS planning committee. Commit to working on an ad hoc committee of one or more of the film theme(s). Make a list of little known facts about the community justice theme(s) that you learned to share with all. Tell your story, record your struggle and journey to justice, freedom, equality, and inclusion. Video and audio record your efforts the meetings, presentations, protests, everything. Research and consider running for office and boards share the information. Create and or sponsor/co-sponsor at least one activity for children of all ages on social justice awareness. Sponsor senior citizen activities especially those living in low income housing that put them in touch with their representatives, i.e, post card mailings to legislators and local officials. No one can do everything for themselves, but we all can do something that helps everyone in our community. 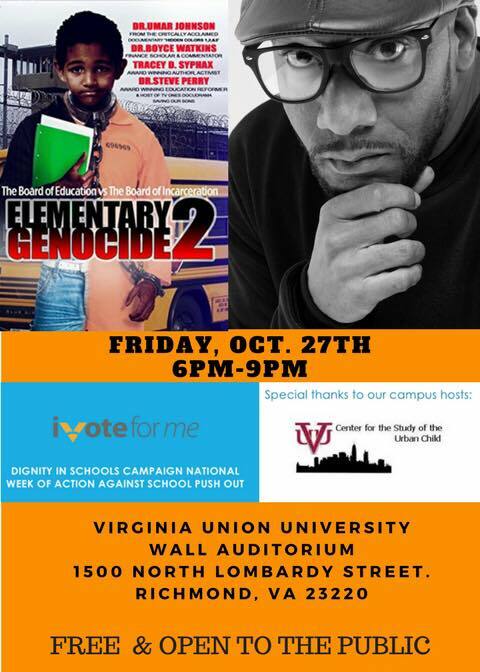 Please join I Vote For Me for their upcoming screening of Elementary Genocide 2: The Board of Education vs. The Board of Incarceration. This film addresses the School-to-Prison Pipeline, a system of referring students to law enforcement that has had a profoundly negative impact on youth in Virginia, which has the highest rate of referrals in the nation. The film director Rahiem Shabazzwill be present to provide commentary and answer questions following the film. As we gear up for our November 12th event on Transportation, we note that Richmond residents are currently immersed in a struggle that touches on issues central to the work of our film series: housing, public safety, and transportation. On Sept 12th City leaders held a meeting to address increased violence in Richmond’s public housing. While the topic of this meeting was public safety, the public was not invited. While the community discussed was residents of public housing, those residents have not been included in generating solutions. Despite the city’s attempt to disenfranchise those who most need to be at the table, members of our team were present and demanded a voice. You can see footage of that meeting here. While residents of public housing in Richmond are not only disproportionately impacted by violence, but also by low access to viable transportation, the proposed solutions of our city government are to further imperil the access of RRHA residents to what transportation they currently have. Richmond city mayor Levar Stoney, along with our police chief Alfred Durham, have proposed to address violence in public housing through the implementation of a parking decal system. The Community Justice Film Series has a large planning team, and an even larger community of individuals across the city who care about education, safety, housing, transportation, health, and wealth-building. We come together as a community during our free time because we are engaged, inspired, and knowledgable. We know what works, and we expect just treatment from our public officials. Parking decals will have no impact on gun violence in our neighborhoods. It will, however, mean increased revenue for towing companies and increased costs for already financially-strapped individuals and families. The choice to implement this program was made without input from the community and without regard for outcomes. Across Richmond, residents are organizing against this directive, speaking out against further economic disenfranchisement of our poorest residents and speaking in favor of the solutions we know will work: just treatment in our schools, from our police, in our homes, in our access to transportation, with regard to our health, and in our ability to access living-wage jobs. Please join us at the upcoming RRHA meeting on October 18th, at 901 Chamberlayne Parkway at 5:30pm. Support your community and make your voice heard. In his “Message to the Grassroots,” El Hajj Malik El Shabazz (writing then as Malcolm X) argues that land is the first and most fundamental tenant of freedom. He makes a compelling case that this is a global truth, and the foundation for three centuries of major revolutions. His message to the grassroots is as relevant today as it was in 1963. Indigenous communities continue to fight for land access eroded by centuries of colonial advancement and treaty violations. Rural communities relaunch old fights for land rights anew as fracking expands across the American landscape. Throughout the nation economic and racialized disenfranchisement forces the question again in the form of housing. As in the nation, so it is in Richmond. The last two decades have made Richmond a very different city, with rapidly changing demographics along lines of race and household income. While many agree Richmond is in need of development, we must carefully consider the ethical questions that underpin this endeavor: who should benefit from development, and who decides? Our current model of development does not favor a people-centered approach to wealth-building. Rather, we see a pattern of economic displacement that follows directly from Richmond’s history of racialized disenfranchisement. Housing accessibility in Richmond today is in crisis. Affordable Housing is no longer accessible within range of available jobs. Public Housing faces an overhaul without clear participatory engagement from residents. In an economic system that so tightly ties geography to life outcomes, equitable housing access is, as the Charles Hamilton Houston Institute recognizes, “a critical element in our nation’s opportunity structure.” Meaningful housing access has the capacity to generate access to all of the target subjects of this film series: education, food, public safety, and wealth building. As our communities are dispersed through housing reduction, so too is their ability to self-organized impaired. We invite you to join with a community of people concerned about housing access in Richmond for film, discussion, and solution-oriented planning. Join us at The University of Richmond Downtown on August 17th from 6:00pm to 8:30pm. The gathering is free, family-friendly, and part of an ongoing effort to bring Richmonders together in support of more equitable personal and economic advancement for all. For some people in the greater Richmond community, choosing where you live is about location, asset-building, property values, and school districts. There is a quiet luxury of choosing safety and using housing as a way to leverage resources and develop wealth. However, there are many Richmond residents who are subjected to unjust housing laws and practices — even while working hard to create a different reality for their families. Sadly, unjust practices are nothing new, as the Richmond region has long suffered from the repercussions of its past. Beginning in the 1930s, federal housing policy promoted segregation through incentivizing the growth of white, middle-class suburban areas. Entire neighborhoods were denied credit — or red-lined as the act came to be known due to the red line that realtors, insurance agents, and mortgage lenders would draw around African American neighborhoods. In essence, a dual track housing policy greatly influenced the current state of our region today. Public safety and community justice are not mutually exclusive, societal objectives. In theory the goals of both are broadly rooted in the U.S. Constitution and daily demonstrated — for better and for worse — on American streets. In reality, it is necessary that we deepen our perspective on public safety as a community justice concern, in order to ensure just and equitable communities throughout our beloved city. There cannot be public safety without community justice, because without community justice, only some are safe. We suggest that at the root of public safety is the basic human desire to live in consciously caring neighborhoods, where children are able to play outside without worry, where elders are comfortable with moving about, and where there is a sense of community, respect, and neighborliness. When we understand how these ideals are necessary to one another, we are better able to assert our needs — to one another as citizens as well as through policy and law. When residents are relatively secure in the knowledge they are safe from harm and that their well-being is affirmed by a non-toxic environment, they are better able to broadly focus on building the skills, assets, and social ties that will sustain a lifetime. Whole body well-being is our attempt to look into what we are and what we become as individual citizens in this what we call “Community.” We suggest whole body as the collective mental, physical, spiritual, and emotional presence of entities that share in humanity. We further suggest well-being as the condition that provides for continued creativity, evolution, and expansion of life. "Education is political and powerful. Beyond classrooms, schools and institutions, knowledge gives an individual the ability to affect their destiny and impact the community and world in which they live. It is a potent and dominant factor in the level of success that a person or a community can ultimately achieve — not only related to our educational system, but also related to our daily interactions and approaches to educating one another..."
"Justice is a common theme throughout American history, with varying perceptions of goals and definitions along the way. While some may feel as though justice is alive and well, many citizens with a close pulse on the diverse communities of our country identifying with a growing perception of the divide regarding just and fair treatment for individuals within the intersection of race, class, and culture..."